Before Amazon.com and iTunes existed, we bought CDs and records at...wait for it...record stores. The release of a new album by a big band was an event, in part because there was almost no chance any of us ordinary folks could hear it before the official release. The Internet was still too primitive, and only radio stations were likely to have advance copies. For some of the bigger albums, the Tower Records across town would begin selling the new album at midnight. We'd have to drive a ways to get there, and there could be a line around the store as fans showed up to get their hands on the new album as soon as it was available. I waited in this line when Guns N' Roses released Use Your Illusion I and Use Your Illusion II in 1991. I remember the excitement of the crowd as we waited. It seemed like we were part of something. 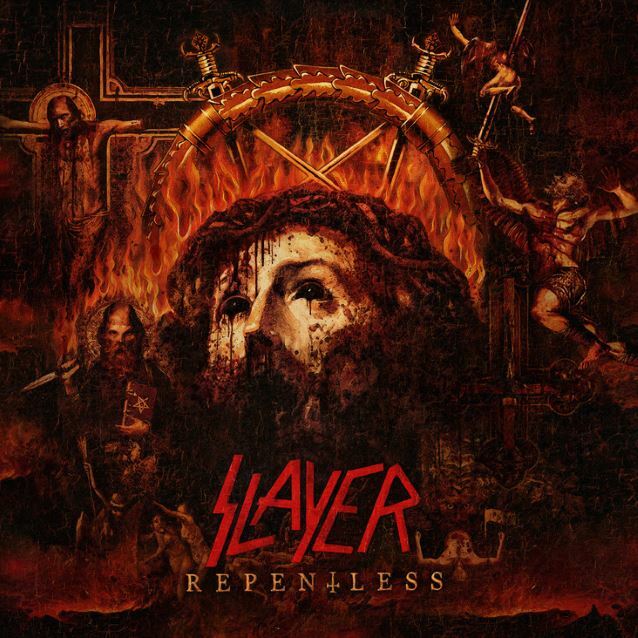 Today is the day Slayer releases their 12th album, Repentless . It is their first album after the death of guitarist Jeff Hanneman. Exodus' Gary Holt, who has been touring with Slayer since 2011 plays on the album in place of Hanneman. This is also Slayer's first album since drummer Dave Lombardo quit the band and was replaced by former drummer Paul Bostaph. But even with these two big changes to the lineup, the album manages to sound like Slayer. I won't be waiting in any lines today. I was able to find the entire album online a few days ago without much effort. I have only had a chance to listen to it once so far, so it wouldn't be fair to call this a review. I was very impressed with what I heard. And besides, with a cover like this, how can it not be good? I will either stop by the local Best Buy and pick up the album on my way home from work today or order the album from Amazon.com this weekend. I don't much care for downloading music; I want my hands on the physical CD. And while it is certainly convenient to be able to order music online, I'd be lying if I said I didn't miss the excitement of the record store album release events. I guess I'll just have to console myself with a new Slayer album.